This entry was posted in Joke, Murmuring, Recreation on April 30, 2006 by Gea-Suan Lin. This entry was posted in Computer, Murmuring, Network, Social, WWW on April 29, 2006 by Gea-Suan Lin. This entry was posted in Computer, Murmuring, Network, Security, Software, WWW on April 28, 2006 by Gea-Suan Lin. This entry was posted in Computer, Murmuring, Network, P2P, Software on April 28, 2006 by Gea-Suan Lin. 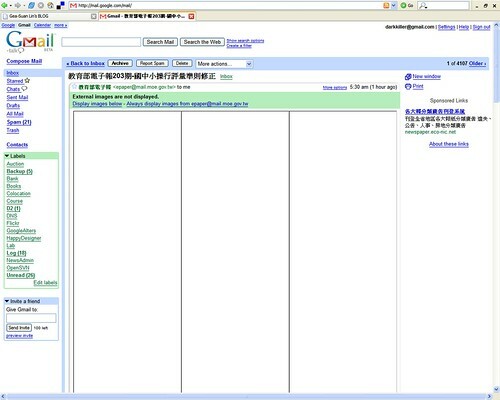 This entry was posted in Computer, Mail, Murmuring, Network, Spam on April 28, 2006 by Gea-Suan Lin. This entry was posted in Computer, Murmuring, NCTU, Network, Search Engine on April 28, 2006 by Gea-Suan Lin. This entry was posted in Computer, Linux, Murmuring, Network, OS, Software on April 27, 2006 by Gea-Suan Lin. 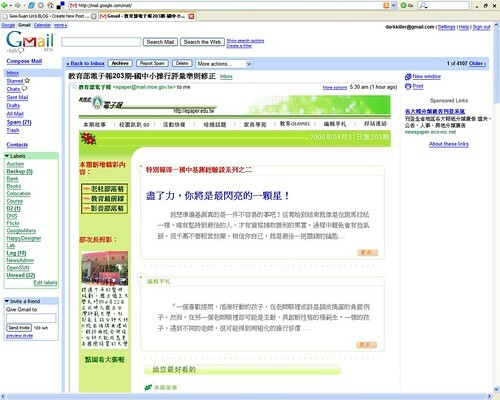 This entry was posted in Computer, Murmuring, Network, Search Engine on April 26, 2006 by Gea-Suan Lin. This entry was posted in Computer, Murmuring, Photo, Recreation, Security on April 26, 2006 by Gea-Suan Lin. This entry was posted in Computer, Murmuring, Network, P2P, Software on April 25, 2006 by Gea-Suan Lin.